The Seminar would provide opportunities to meet and hear from library professionals, leaders, LIS faculty members and information scientists from different parts of the country. The seminar welcomes submissions of research and scientific papers, case studies, working papers, etc. related to seminar theme and sub theme. The paper submitted should have been neither published anywhere nor kept under consideration for publication in any form. All papers will go through a review process and accepted papers will be published in the Seminar Proceedings/Edited Book. 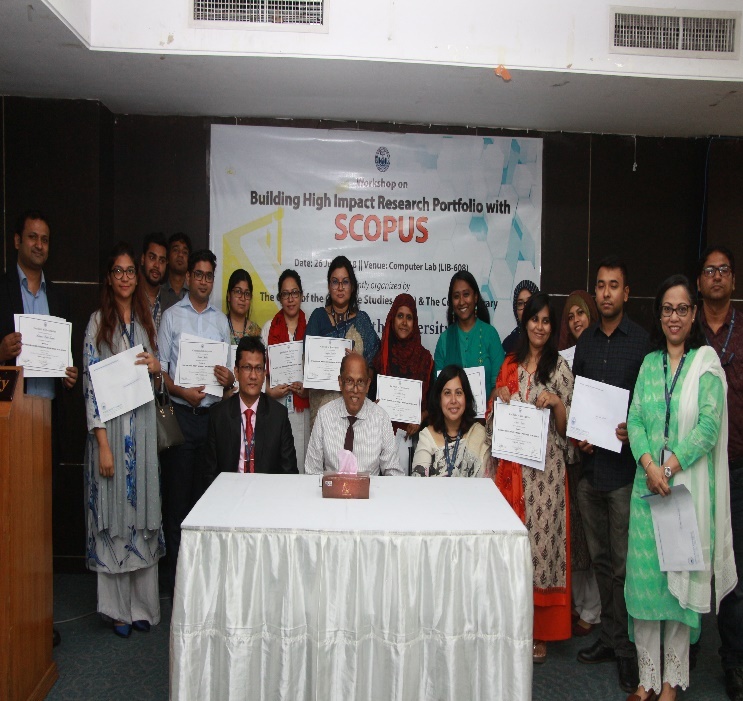 North South University Library and Office of the Graduate Studies jointly organised a workshop, titled “Workshop on Building High Impact Research Portfolio with Scopus” on 26 July 2018 at 11:20 AM – 12: 50 PM (LIB-608). Total twenty-seven faculty members from various schools and departments participated in the program. Mr M M Shoeb, Sr. Assistant Librarian, in his welcome speech mentioned the objective of the workshop, the importance of the Scopus indexed journals for better citation and impact in QS Ranking. Dr Md. Zahid Hossain Shoeb, NSU Librarian, described Advanced Search Techniques on Scopus, Search Result Analysis Procedure, Several Journal Metrics, and Journals Scientific Prestige etc. Professor Sharif Nurul Ahkam, Director, Graduate Studies, showed the research techniques based on Scopus citation database. The workshop ended with a Question/Answer session and at the end of the session Professor Sharif Nurul Ahkam, Director, Graduate Studies, and Dr Md. Zahid Hossain Shoeb, NSU Librarian, distributed certificates among the participants of the program. 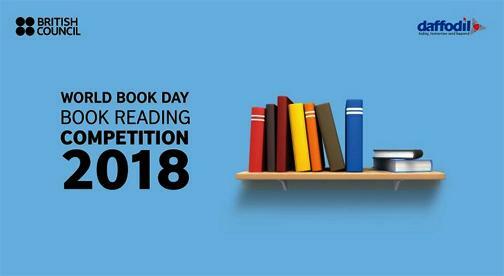 Koishor Tarunnye Boi is a book reading campaign of the leading publishing houses of Bangladesh. The campaign entered its second year recently. This platform was inaugurated on 23 July 2016. To celebrate this occasion they organised a three-day book fair. The fair kicked off at the premises of Rajuk Uttara Model College in Dhaka. Children’s literature author Ali Imam inaugurated the fair as the chief guest. In his speech he said, dreams are born from reading books. Koishor Tarunye Boi president Tushar Abdullah presided over the ceremony. He emphasizes on reading books in spite of dependence on machines. Rajuk Uttara Model College principal Mr Kazi Showkat Alam and journalist Mr Tushar Abdullah were present at the event as the special guests. 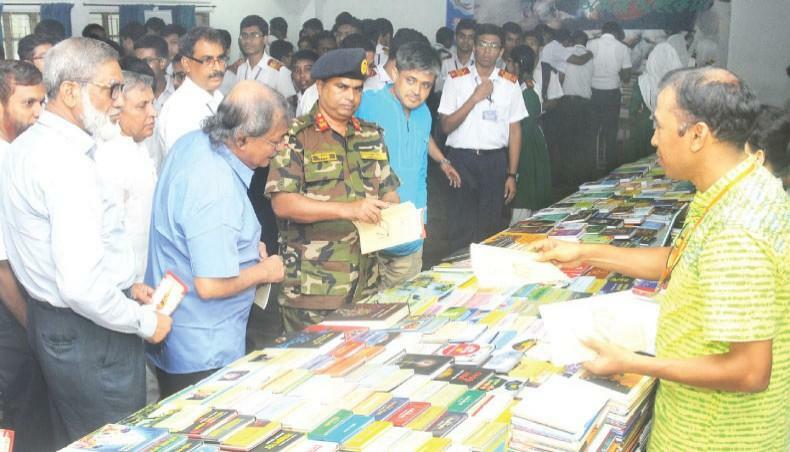 It was the 42nd book fair organised by Koishor Tarunnye Boi. A total of 12 publishers have participated in the fair. Nurul Islam Mahfuz, Deputy Director (LID, IIUC) & Faculty Member (LIS, IIUC) and Md. Monirul Islam, Librarian of Army Medical College Chittagong are going to attend the 3rd International Conference of Asian Libraries on Building smart libraries: changes, challenges, issues, & strategies. The said conference is jointly organised by Central University of Kashmir (CUK), Kashmir, Asian Library Association (ASIALA), New Delhi and International Federation of Library Association (IFLA) taking place at CUK, Srinagar, Kashmir during August 6-8, 2018. 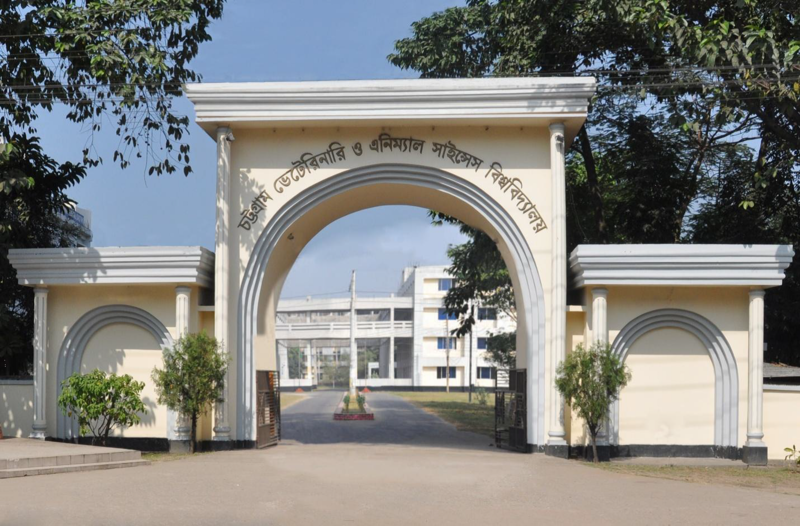 The research paper titled ‘Automation system at International Islamic University Chittagong (IIUC) Library in Bangladesh: A status report’ authored by Nurul Islam Mahfuz and Md. Monirul Islam was accepted to publish in the conference journal earlier and authors are invited to give an oral presentation in a session on the paper. Firstly, I am starting my writing with an excellent news in the Library and Information sector in Bangladesh. The Librarian and Assistant Librarian posts have been created in Dakhil, Alim, Fazil and Kamil Madrasas. It is undoubtedly good news for Bangladeshi library profession. When the process of recruitment of Librarian and Assistant Librarian to MPO affiliated madrasas will start public relations will be increased in the profession. I personally applaud to the former and current leaders of the Library Association Bangladesh (LAB) and Bangladesh Association of Librarians, Information Scientists and Documentalists (BALID), including all public and private officials involved in this initiative. 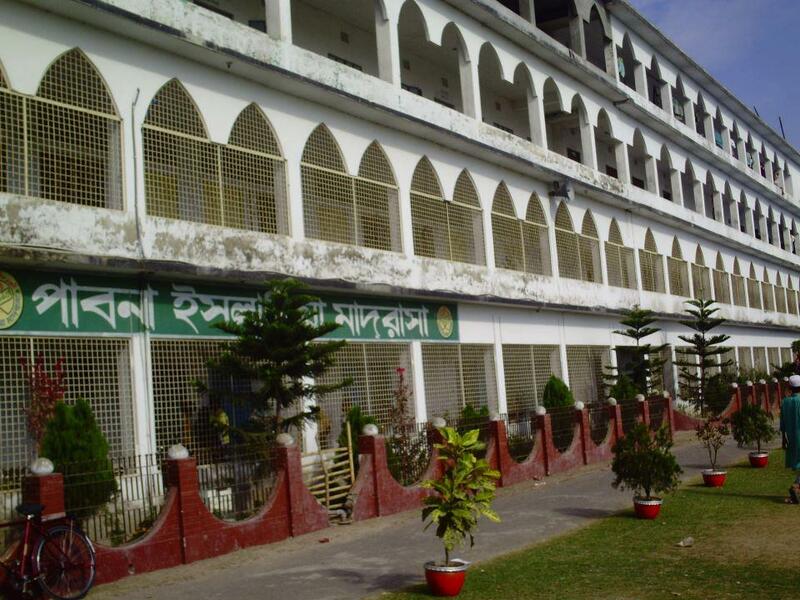 Madrasas are widespread educational institutions located all over Bangladesh. They are involved with educating children in rural and urban areas. Madrasa Education Board was formed in 1978 under the Ordinance for the Modernization of Madrasa Education. According to the Madrasah Education Department, the total number of madrasas in the country is 9, 137. The Private Educational Institutions (Madrasa) Manpower Structure and MPO Policy-2018 was released on 19 July 2018. This announcement will create and open a significant job opportunity in Bangladesh as well as establishing an excellent scope for the library and information science sector. But there are some inconsistencies in this announcement in compare to other positions, which require reforms. Notification issued of Private Educational Institutions (Madrasa) Govt. Salary Part and Manpower Structure Policy-1995. Assistant Librarian positions were created in this announcement and the required qualification for this recruitment was a Graduate degree in any discipline with a Diploma in Library Science. The Ministry of Education issued a circular on October 25, 2011, for the appointment of Assistant Librarian in Dakhil and Alim Madrasa similar to Secondary and Higher Secondary. 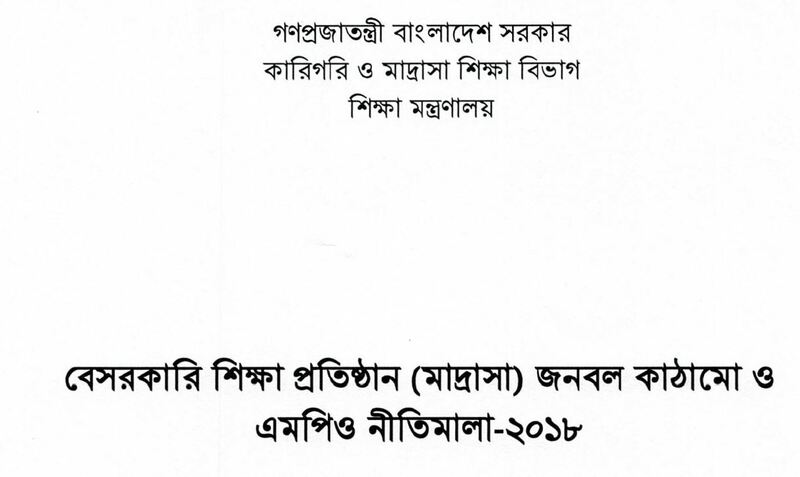 It was said in the serial number of the Circular (d) “Submitted as Secondary / Higher Secondary and Assistant Librarian included in Alim Madrasa”. As a result, recruitment of assistant librarian in Dakhil and Alim Madras started. On April 15, 2012, a circular was issued and Dakhil and Alim Madrasas stopped the recruitment of assistant librarian posts. It was said that these positions cannot be recruited until the educational qualification, the fixation of the salary structure and the appointment policy are made properly. Notification issued of Private Educational Institutions (Madrasa) Manpower Structure and MPO Policy-2018. In this policy, Librarian and Assistant Librarian positions have been reformed for Dakhil, Alim, Fazil and Kamil Madrasas. However, the educational qualifications for these requirements have been kept different. b) Diploma degree in Library Science. That means, after completing a Graduation and Master degree in other discipline and with a Diploma degree in Information Science and Library Management or evening Master degree holders in Information Science and Library Management and Honors and Master degree holders in Information Science and Library Management none is eligible to apply to the madrasas for Librarian and Assistant Librarian position. They will not be eligible for appointed for these positions which are unfair and discriminate policy. Librarian and Assistant Librarian recruitment of the Private Educational Institutions (Madrasa) Manpower Structure and MPO Policy-2018 is clear discrimination between the madrasa and general education system and this discrimination cannot be accepted in any way in the librarian profession. The government has a mandate in establishing Digital Bangladesh and the LIS professionals are playing a significant role to support in the process. Very recently I came to know through a social media status that many graduates from other prestigious universities i.e. 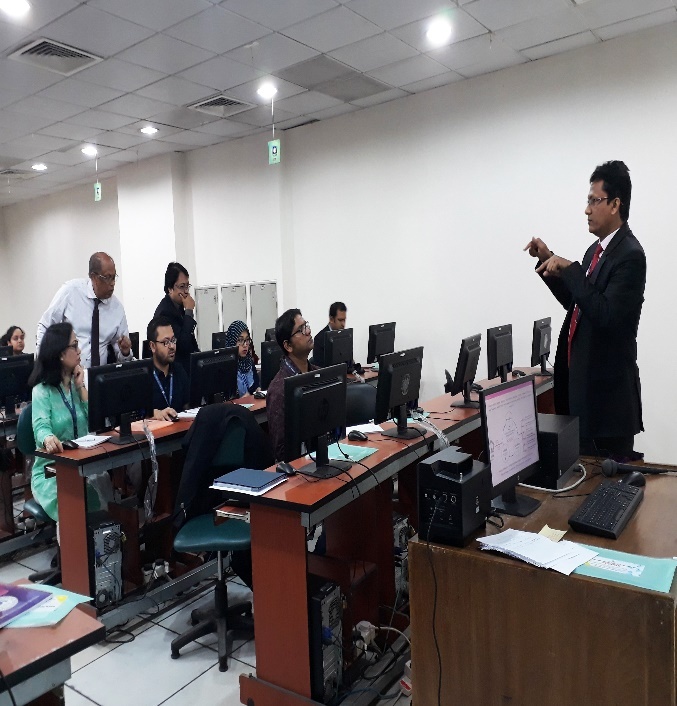 Dhaka University Business Faculty students have enrolled in Information Science and Library Management to study the subject due to the current importance and job prospects. This notice will be hindering the current flow and development of the LIS profession in the country. Under the current curriculums of LIS education, a Graduate or Post-graduate or Diploma student in Library and Information Science are considered and eligible for working in any National, Academic, Public and Special Libraries. A student in Library and Information Science is being trained to work with any kind of libraries. Arabic is a language similar to other different languages in the world. The librarians are being developed in such a way that they can meet special needs in the specialized institution. The language is not a significant issue to get recruitment in madrasa as a librarian or assistant librarian. The technical terms in the LIS profession i.e. LCSH, MARC21, AACR2, RDA can be managed in Arabic/Urdu or whatever language collections are in the madrasa libraries. The Education Policy 2010 seeks to bring all students of the country, irrespective of their religions, genders, physical limitations, socioeconomic and geographic locations, under one system. In a policy statement, the Government had taken specific policies to modernize the madrasa education system. And the recruitment of Librarian and Assistant Librarian are the part of the madrasa modernization policy similar to other compulsory subjects (i.e. Introduction to Environmental Studies), Information Technology, and Science. As a result madrasa students are receiving equal opportunity to apply in accordance with the country’s traditional education system and job structure. The authority should follow the same rules for all ordinary students. The process of recruitment of Librarian and Assistant Librarian in Dakhil, Alim, Fazil and Kamil Madrasas should be stopped until a fair and undiscriminating notice is issued by the authority. This announcement, particularly for Librarian and Assistant Librarian eligibility sections, should be re-considered before starting the appointment activity. Otherwise, other new crises will occur in the education systems. The library professionals are seeking a quick settlement of this discrimination and injustice for the development of madrasas education systems and establishing equal opportunities for all citizens in the country. 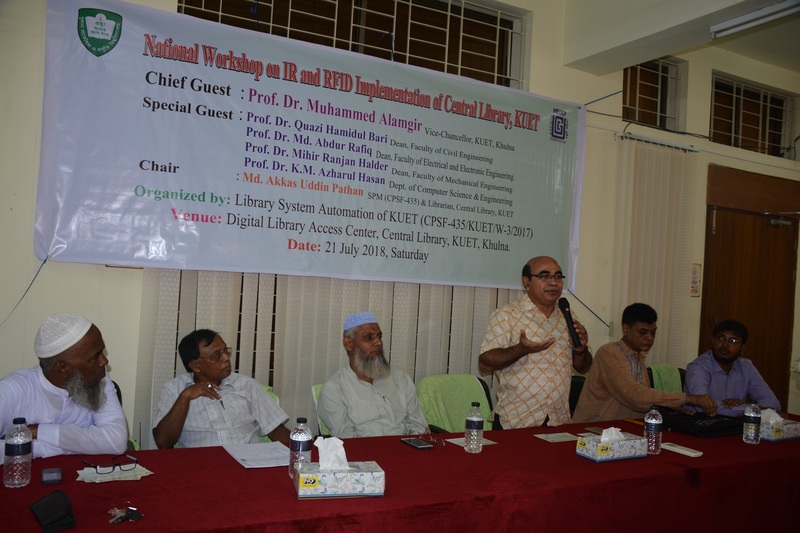 Inauguration of RFID system and a daylong National Workshop on IR and RFID Implementation of Central Library, Khulna University of Engineering and Technology (KUET) was held on 21 July 2018 at Digital Library Access Center, Central Library, KUET, and Khulna. The event was organised by Sub-Project (CPSF-435/KUET/W-3/2017) and funded by the Higher Education Quality Enhancement Project of University Grants Commission (UGC) of Bangladesh. In the inaugural session, Prof. Dr Muhammed Alamgir, Vice-Chancellor, KUET was present as the chief guest while Prof. Dr Quazi Hamidul Bari, Dean Faculty of Civil Engineering, Prof. Dr Md. Abdur Rafiq, Dean, Faculty of Electrical and Electronic Engineering, Prof. Dr Mihir Ranjan Haldes, Dean, Faculty of Mechanical Engineering, Prof. Dr K.M. Azharul Hasan, Dean of Computer Science and Engineering were present as the special guests. Mr Md. Akkas Uddin Pathan, SPM(CPSE-435), HEQEP and Librarian, Central Library, KUET presided over the session. The participants from sixteen different universities attended in the National Workshop. The participants and universities in this event are Mr Md. Hafizur Rahaman Mollah, Deputy Librarian, and Mr Md. Kamrul Ahsan, Pabna University of Science and Technology (PUST), Mr Sheik Md. Jalal Uddin, Librarian(In Charge), and Mr Md. Saiful Islam, Junior Librarian, Central Library, Jatiya Kabi Kazi Nazrul Islam University(JKKNIU), Mr Muhammad Rashidul Islam, Principal Library Officer, Mr Saiful Islam, Senior IT Officer, Northern University of Business and Technology, Khulna(NUBT), Mr Khundker Noor Elahi, Assistant Librarian, Mr Md. Rafiquar Rahman, Assistant Librarian, Central Library, Rajshahi University(RU), Mr Md. 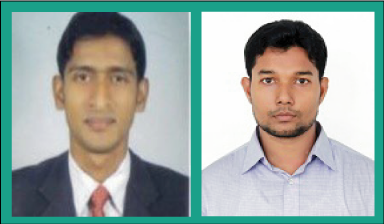 Nasirul Islam, Deputy Librarian, Mr Sudarshan Saha, Assistant Programmer, Bangabandhu Sheikh Mujibur Rahman Science and Technology University(BSMRSTU), Gopalganj, Mr Md. Alamgir Hossen, Documentation Officer, Mr Nittondo Shill, Cataloguer, Central Library, Patuakhali Science and Technology University(PSTU), Mr Md. Shamim Rahman, Programmer, Mr Md. Mehedi Hasan, Assistant Librarian, Jessore University of Science and Technology(JUST), Mr Md. Mahbub Alam, Additional Librarian, Rajshahi University of Engineering and Technology(RUET), Mr Md. Abdur Rouf Bin Abedin, Deputy Librarian, Hajee Mohammad Danesh Science and Technology University(HSTU), Mr Abdullah Al Mamun, Library Officer, Stamford University Bangladesh(SUB), Dr Kazi Moklesur Rahman, Librarian, Mr Kazi Ferdous, Deputy Librarian and Mr Md. Ainul Moin Noor, Section Officer, IT Cell, Khulna University(KU), Mr Md. Abu Awal Siddique, Deputy Librarian, and Mr Md. Sirajul Islam, System Analyst, Dhaka University of Engineering and Technology(DUET), Mr Md. Abdul Aziz, Deputy Librarian, Islamic University, Kushtia, Ms Duali Biswas, Library In Charge, Mr Md. Mahdi Hussain, Programmer, North-Western University(NWU), Ms Tanzeba Raihan Shoma, Deputy Librarian, (programming) and Mohammad Azharul Hoque, Deputy Librarian (Automation), Central Library, University of Dhaka (DU). 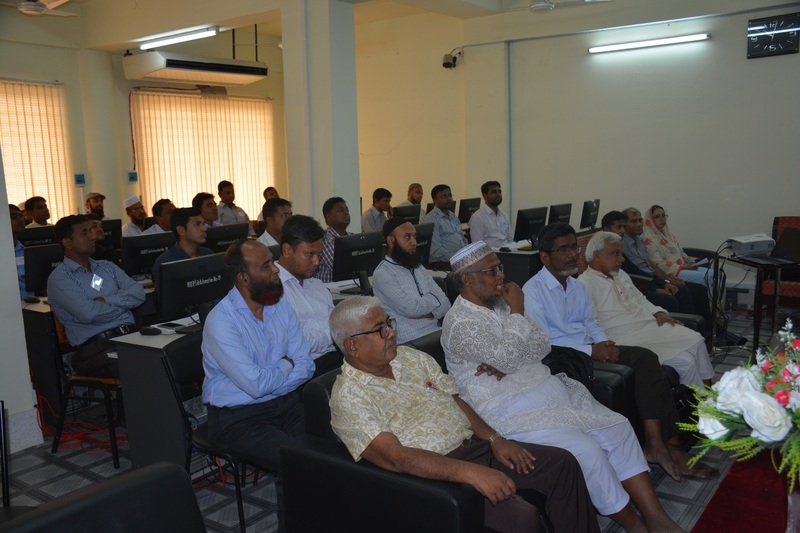 There were six staff from Khulna University of Engineering and Technology also attended the workshop. They are Engr. Mehirlal Sarkar, Programmer, Mr Sujit Basu, Internet Service Officer, IICT, Mr Pabitra Kumar Saha, Section Officer (G-1), Central Library, Mr Md. Mostafizur Rahman, Cataloguer, Central Library Mr Md. Baizid Hossain Mollah, Data Processor, Central Library, Mr Md. Mahmud Ali, Head Assistant, Central Library. Prof. Dr Muhammed Alamgir, Vice-Chancellor, KUET appreciated the role, Mr Md. Akkas Uddin Pathan, Librarian, KUET regarding the implementation of latest technology at KUET Central Library. The workshop participants learned and seen their activities especially Institutional Repository and Radio Frequency Identification (RFID). On 22 July 2018, there was a scenic cruise tour on the Pasur River for the participants organised by the workshop authority. The World Bank e-resources project for UDL is closing soon: What is next? The World Bank team on the 4th day of 17th Implementation Support Mission held a meeting with the officials and representatives of the beneficiary institutes of the UGC Digital Library (UDL) at UGC auditorium on Sunday 15 July 2018. The library professionals from public and private universities, International and Research organisations attended the meeting and opined their views. Since the World Bank project is going to be ended soon, the subscribers have to pay the full amount for the membership instead of twenty percent payment. How the professionals will approach this fact with the respective authority, implementation effect, trail resources subscriptions and statistical facts and figures were discussed. Up to June 2018 University Digital Library (UDL) provides 31000 e-books, 3100 e-journals, 10000 conference proceedings by 13 different publishers. At present there are ninety Bangladeshi organisations are subscribing to the UDL resources including 34 Public Universities, 51 Private Universities, 01 International University, 02 Research organisations and 02 training institutes. Professor Dr Mohammad Yousuf Ali Mollah, Member, University Grants Commission of Bangladesh (UGC), delivered an introductory speech at the meeting with Professor Dr Md. Akhtar Hossain, Member of UGC, in the chair. Jaminur Rahman, Senior Program Officer of UDL, presented the progress report of UDL at the meeting. Dr Gauranga Chandra Mohanta ndc, the Project Director of HEQEP and other officials and consultants of HEQEP were also present at the meeting. As the World Bank e-resources project for UDL is closing soon: What is next? Ms Shaharima Parvin, Assistant Librarian, East-West University attended the 9th International Conference on Social Media & Society. This conference is an annual gathering of leading social media researchers from around the world. The conference was held in Copenhagen, Denmark from July 18 to 20, 2018. The said conference was organised by the Social Media Lab at Ted Rogers School of Management at Ryerson University and hosted by the Centre for Business Data Analytics at the Copenhagen Business School. The conference provides participants with opportunities to exchange ideas, present original research, learn about recent and ongoing studies, and network with peers. 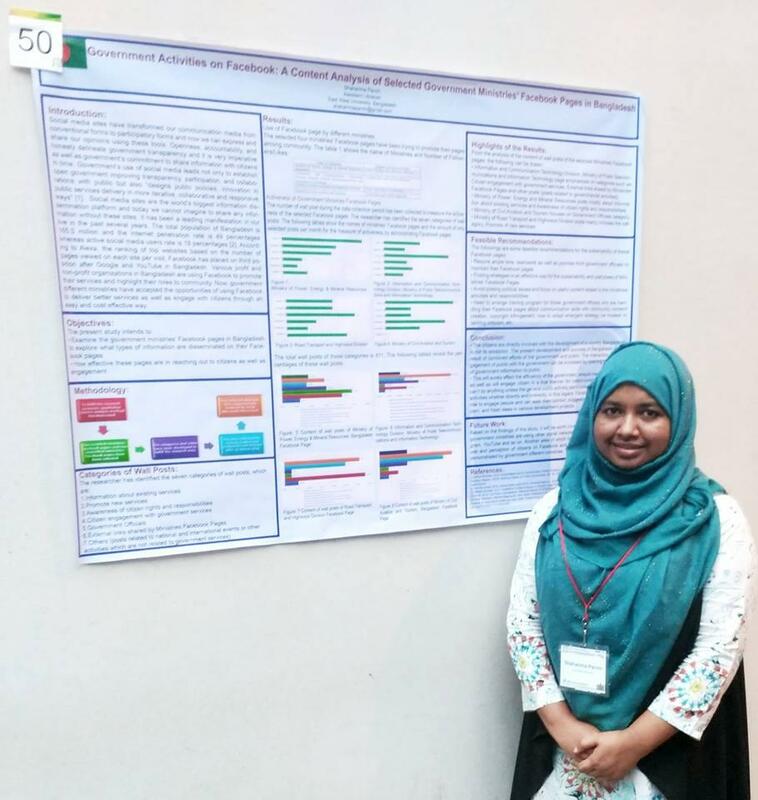 Ms Shahrima presented a poster entitled “Government activities on Facebook: A Content Analysis of Selected Government Ministries’ Facebook Pages in Bangladesh”. The conference was focused on the best practices for studying the impact and implications of social media on society. Here it is mentioned that earlier Ms Shaharima Parvin was selected as a fellow of the Jay Jordan IFLA/OCLC Early Career Development Fellowship Program for 2016. Congratulations to Ms Shahrima Parvin on her continuous achievement and successes. Cox’s Bazar District Government Public Library organised several competitions including book reading, easy writing, recitation, and drawing on the occasion of the Independence Day and National Day of Bangladesh, Bangla New Year, and the 119th birth anniversary of the National Poet Kazi Nazrul Islam. To give awards and certificates, the library organised a prize and certificate award session on Sunday 15 July 2018 at District Government Public Library, New Circuit House Road, Cox’s Bazar. Mr Md. 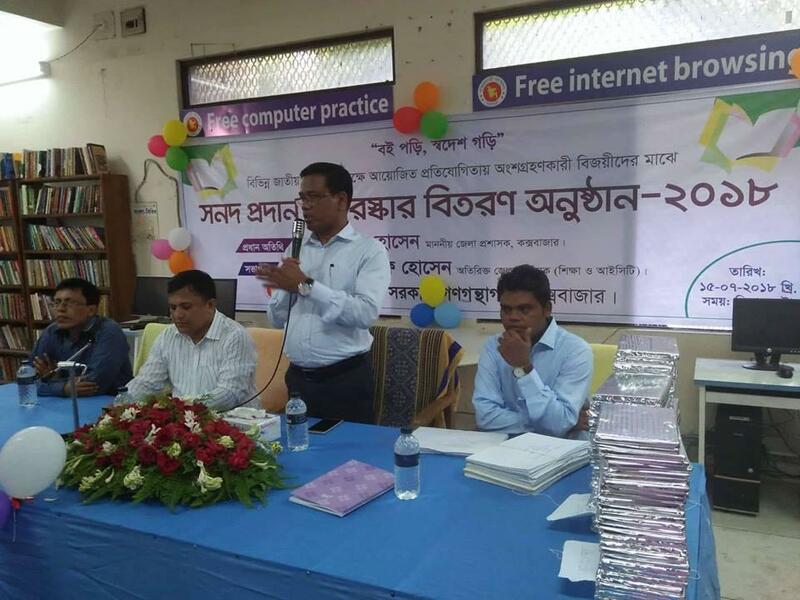 Kamal Hossain, District Commissioner Cox’s Bazar was present in the event as the chief guest while Muhammad Ashraf Hussain, Additional District Commissioner (Education and ICT) Cox’s Bazar presided over the event. Mr Md. Kamal Hossain, District Commissioner Cox’s Bazar, emphasised on book reading, cultural activities and its importance in his speech. Mr Rishikesh Paul, Librarian, Cox’s Bazar, District Government Public Library initiated to organise the event. He delivered a welcome speech on the occasion. The continuing students from different age groups of several educational institutions took part in the mentioned program.